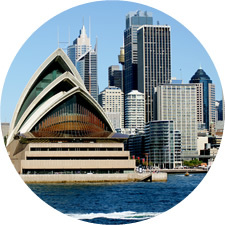 Sydney, Australia is a part of the Logistics Plus® network. This office provides air and ocean freight forwarding, inland ground and rail, warehousing and distribution, project cargo, import/export, and global trade compliance services. Sydney was originally established as a penal colony in 1788 by Arthur Phillip. This makes Sydney the first British colony in Australia. Sydney Airport is the busiest in Australia, and the 27th busiest airport in the world. Port Jackson—widely known as Sydney Harbour—is a natural inlet of the South Pacific Ocean and is considered to be one of the world’s finest harbors. It showcases the iconic Sydney Opera House and Sydney Harbour Bridge. Sydney is also home to a Logistics Plus office where we proudly serve both small and large businesses throughout the region. If you’re located in or near Sydney, Australia, Logistics Plus is ready to provide you with local, domestic, and global transportation and logistics services. Additionally, we’ll show you how our people put the “plus” in Logistics Plus by doing the big things properly, and the countless little things, that together ensure complete customer satisfaction and success!